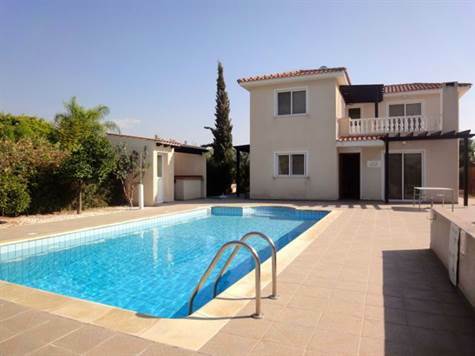 Coral Bay, Paphos - This beautifully presented 4 bedroom detached villa is situated in a quiet residential cul-de-sac in Coral Bay, one of the most popular areas in the region of Paphos to live and holiday. The main sandy beach of Coral Bay and a wide variety of shops and restaurants are within very easy walking distance. The kitchen is well equipped with granite worktops, built-in oven, electric hob and stainless cooker hood, integrated dishwasher, fridge/freezer and washing machine. Patio windows provide easy access to the large outside terrace. Upstairs is a very spacious master bedroom with en-suite shower room, a second double bedroom and family bathroom. A large balcony with lovely views of the coast and surrounding area can be accessed from both bedrooms and directly from the landing. The outside area has been designed to enjoy the wonderful outdoor life. The pool and leisure area is screened by tall hedges, making it a very private space. To the side of the heated swimming pool is a purpose built bar, fitted bbq, toilet facilities and pool shower. A lot of care and attention has been put into this property by the current owners and it is very well maintained. It is ideal as a permanent or holiday home and has full title deeds. Please refer to MLS#: 193 when inquiring.